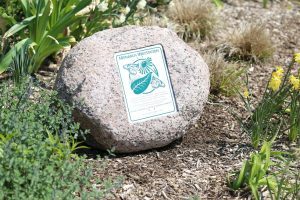 The Monarch Waystation designation that Palatine Park District has been awarded for the front of Community Center is through the Monarch Watch Organization. This organization is an outreach program focused on education, research, and conservation relative to Monarch Butterflies. In order to qualify the district needed to meet criteria at this site for pesticide use, land management, and what plants are grown. The re-landscaping of Community Center due to our recent “face-lift” opened the door to the possibility for this to happen. The management practices in all parks are extremely conservative in regards to insecticide usage. In front of Community Center staff needed to have a more strict control of which products are utilized and how pesticides are used. The Land Management criteria were met through adding the irrigation system as well as the practices of keeping the site mulched, pruned, and weed free, and removing dead material when needed. This area has plants that are for cover/shelter that meet the standards for the registry such as our shrubs – Boxwoods and Holly. The grasses, Little Bluestem and Indian Grass, help with cover for the butterflies as well as a place for some native butterfly species to lay their eggs. At this site there are many plants in place for Monarchs as well as for other pollinators to use as a food resource – either the nectar, pollen, or foliage. We have Common Milkweed, Butterfly Weed, Frau Dagmar Haustrup Roses, Peek-A-Boo Allium, Globe Allium, Japanese Lilac Trees, Catmint, Fragrant forms of Daylilies, Asian & Native Lilies, Prairie Blazing Star, Black-Eyed Susan, and Asters. If the perennial plants are slow at filling in the space, some annuals will be planted especially for the Butterflies. 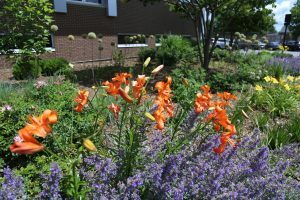 Some of the annuals could include Tropical Milkweed, Mexican Sunflower, Cosmos, Zinnia, Brazilian Verbena, and Lantana. These annuals are easy and very rewarding for anyone to grow at home. These annuals are like the “Field of Dreams” for butterflies: plant them and they will come! This landscape will have different plants in bloom throughout the growing season. Many of these plants are fragrant as well as having colorful flowers. Please don’t walk through the garden; the roses in there are a favorite to look at and smell, but they are well armed. Horticulture Foreman Corey Zak strongly encourages everyone to stop to enjoy the garden at Community Center. Earlier this Spring, the children in the Community Center CARE program released the butterflies they had been nurturing for several weeks into the Monarch Waystation Garden. The children shared butterfly and flower shaped cookies and juice with staff members, and Mr. Zak explained why it is important to create natural areas that attract pollinators.